North Korean leader Kim Jong-un met with a special delegation of South Korean President Moon Jae-in Wednesday, possibly reaffirming his commitment to establishing peace on the Korean Peninsula and denuclearizing his country. "The special delegation met with Chairman Kim Jong-un to deliver the personal letter (from Moon) and exchange their opinions," Seoul's presidential office Cheong Wa Dae said in a brief statement. The statement came hours after Chung Eui-yong, top security adviser to Moon and head of the presidential National Security Council, arrived in the North on a one-day trip. "The special delegation is scheduled to leave (Pyongyang) after attending a dinner," Cheong Wa Dae spokesman Kim Eui-kyeom said. 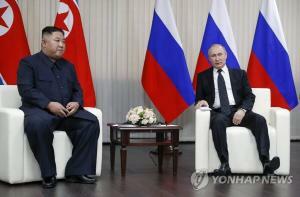 After the dinner, the delegation left Pyongyang at 8:40 p.m., he later added. They arrived in Seoul around 9:44 p.m. and went to the presidential office to report to President Moon. The Cheong Wa Dae spokesman said the outcome of the delegation's trip to Pyongyang will be released Thursday, considering their late return. Chung is heading a five-member delegation that includes the head of the National Intelligence Service, Suh Hoon, and Vice Unification Minister Chun Hae-sung. Chung earlier said he hoped to meet with the North Korean leader during his one-day trip to Pyongyang but that no such arrangements had been made. The North Korea trip by Moon's special envoy is largely aimed at making arrangements for what would be a third inter-Korean summit between Moon and Kim. Chung and the four other members of the South Korean delegation currently in North Korea visited Pyongyang in March for a meeting with the North Korean leader that eventually led to the historic summit between Moon and Kim in the border village of Panmunjom on April 27. 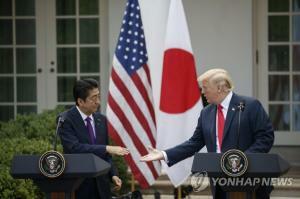 They held their second bilateral summit in Panmunjom on May 26, which was followed by a historic summit between U.S. President Donald Trump and Kim in Singapore on June 12. 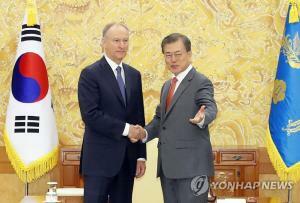 Moon and Kim have already agreed to meet in Pyongyang this month. "First, the delegation will seek to set a specific date for the South-North summit that the countries have already agreed to hold in Pyongyang in September," Chung told a press briefing Tuesday. "Second, it will discuss ways to develop South-North Korean relations by implementing the Panmunjom Declaration," he added. The South Korean officials, however, were also expected to work to remove an apparent stumbling block in denuclearization talks between the United States and North Korea. "The special delegation also plans to hold discussions on ways to completely denuclearize (the peninsula) and establish lasting peace on the Korean Peninsula," Chung said. Denuclearization talks between the U.S. and the North seemed to reach an unprecedented level following the historic U.S.-North Korea summit in June. The talks, however, stalled after Trump called off a scheduled North Korea trip by his Secretary of State Mike Pompeo, citing a lack of progress in North Korea's denuclearization process. Chung, who said he will be delivering a personal letter from Moon to Kim, noted he may also convey the United States' stance to the communist North. "We are always closely communicating with the United States. We are also sharing information related to the visit by the special delegation to North Korea and holding close discussions," he has said. 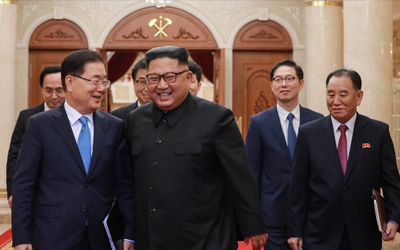 Chung's trip comes amid concerns over a possible discrepancy between the speed of development in inter-Korean ties and progress in denuclearization efforts, especially following a third Moon-Kim summit. 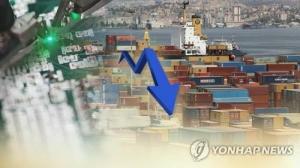 Many in South Korea and the U.S. believe any development in the South-North Korean relationship followed by increased economic cooperation between the two Koreas may weaken or even remove the North's need or willingness to denuclearize in exchange for security guarantees, as well as economic support from the United States and its allies. In a telephone conversation with President Trump held late Tuesday (Seoul time), Moon said improvements in inter-Korean ties will only assist efforts to denuclearize the North. 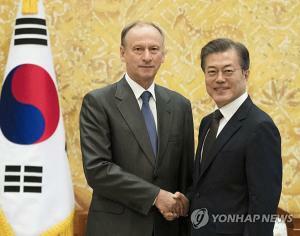 "(Moon) insisted that an improvement in the South-North Korean relationship and reduced tension on the Korean Peninsula will contribute to complete denuclearization of the Korean Peninsula and establishment of permanent peace on the Korean Peninsula," Cheong Wa Dae spokesman Kim Eui-kyeom said of the Moon-Trump talks. 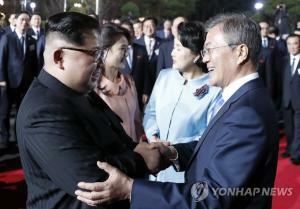 Chung said an improvement in inter-Korean relations may even help salvage the stalled denuclearization negotiations between the U.S. and the North.